The holidays are over, summer is still a few months away, and we all tend to get stuck indoors with our televisions and computers during the months of January and February. It is no surprises these months have been found to have the highest depression rates. Even in sunny California the shorter daylight hours keep many of us inside for the majority of our days and weeks. If we stop to think about it there are probably even stretches of multiple days where we only go outside to get to and from our modes of transportation and our workplaces. For those with children, the thought of getting the kids geared up to go play outside can sometimes be exhausting. -Do a daily routine (checking emails/etc. on phone, reading the daily paper) outside on a bench. -Get off the elliptical or treadmill…take your workout outdoors! -Pick one of the outside tables when you head to Starbucks to do work or study. -Arrange a playdate with other parents/kids at an outdoor playground. -Don’t forget to open your windows to let fresh air in your home from time to time. For children, being indoors is both overstimulating and boring. 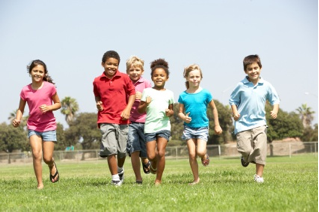 Even the experts agree: “Throughout history, children spent most of every day frolicking outside. Our homes are boring because they replace the exciting sensations of nature (the feeling of the wind on their skin, the brilliant sun, the soft grass, etc.) with an immense stillness (flat walls, flat floors, no wind). (Being indoors) bombards them with jolting experiences that kids in the past never had to deal with: crazy cartoons, slick videos, clanging computer games, noisy toys, and bright colors everywhere...which can make many little children feel stressed." You might deduce that the same can be said for adults with all of the technological gadgets we have to fill our time. To those of you that have weather to contend with in these winter months allow me to share with you an appropriate quote: “There is no such thing as bad weather, just bad clothes.” In other words, if you have the right clothing items you can brave the rain, cold or wind and still be comfortable. In Denmark, where the average winter temperatures are 30 degrees F, parents take their children outside everyday, they just dress them accordingly. So, make time for the outdoors, even if it means pulling on a sweatshirt and reading a book on the porch at 8pm! Your body and mind will thank you.